Contact us to find out more about becoming a member or a sponsor. John founded the team and led the way to secure recognition with the Jamaica Olympic Committee. He formed the Jamaica Racquetball Federation in 1996 and ocntinues to serve as the Director. He is a medal winner for Team Jamaica and continues to coach high level athletes. He won a Bronze and Silver medal at the 2017 Virginia Commonwealth Games. John is professional speaker. Ken is a psychologist who lives in Long Island, NY. He competed in the 1996 Games. Ken has won numerous State Doubles titles. 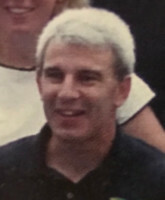 Jeff was one of the original coaches for the team. Jeff is a former Professional Pro Tour Player and won the coaches division at the 1996 Games. Lurine was the first player on the womens team. She earned a medal competing for Team Jamaica. Lurine competed in the 1998, 2000, and 2002 Games. Lurine currently lives in Chicago and is still playing. Don lives in Nebraska and is the former State Doubles Champion in GA. He is a medal winner for the Team Jamaica and enjoys competing in both doubles and singles. 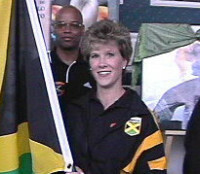 Marie played both singles and doubles for the Jamaica Team. She lived and trained for quite some time in Arizona. Jackie now lives in Florida. Jackie is the former US Army Women's Racquetball Champion. She was a powerful addition to Team Jamaica. Jackie is a remarkable artist as well. Check out her work here. JP has risen rapidly in the sport. Teaming with his Dad (John), he won a silver medal in the 2017 Commonwealth Games and a gold in his singles division. JP is playing on the Liberty University Racquetball team.